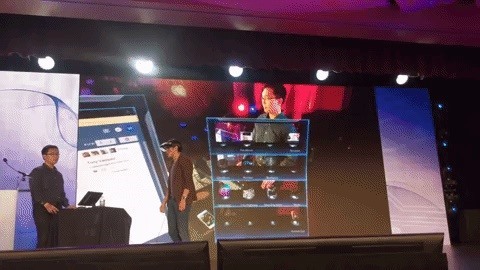 After having personally gone to just about every augmented-reality focused event on the West Coast this year, and there was no sign of the Meta 2 being demoed at these events, I can say that I, and a few others here at Next Reality, began to worry about the product ever coming out. Imagine my surprise to learn at the last minute that not only would Meta be at the Augmented World Expo, they would be demoing the Meta 2. Finally! I will get to try what seems to be an impressive product. 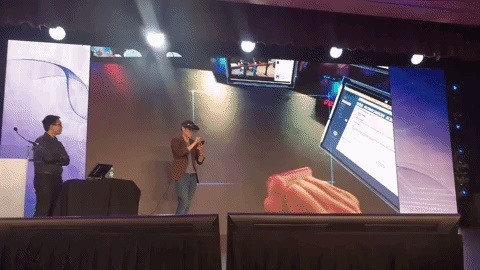 The highly charismatic CEO of Meta, Meron Gribetz, a member of the Next Reality 50 People to Watch, gave an amazing stage demo of the Meta 2 and their new virtual desktop system at AWE. With simple grab-and-drop gestures, Gribetz was able to create windows with applications that are used by most people every day. As a complete 3D immersive replacement for your TV or monitor, this head-mounted display looked as though it could work in a fashion that most people work. Then he took it a step further and started pulling photos and notes out of his phone and putting them in the space around him. Or putting things from the space around him back into his phone. It was a stunning display. And while I am often accused of being way too optimistic, I do have a side that can be a bit of a pessimist. Watching a demo on stage is one thing, but can it do that when I am using it? Can it do what I and so many others are saying about working in a 3D environment? Can it improve my workflow by allowing me to compartmentalize in 3D space how I might if I had my tools on a workbench? This was the test. This was the reason I had scheduled a meeting with Ryan Pamplin, Meta's VP and evangelist. I wanted to get the full demo. I must say the Meta booth was in complete chaos when I arrived to meet with Pamplin on the last day of the event. A line of 40 or more anxious people awaiting their turn to try one demo they had going. Ryan walked me in and started giving me the overview. One of the first attributes you notice when seeing the Meta 2 is its size. Along with its size comes the assumption that it will weigh a great deal. When it was put on my head, I was surprised at how light it was. It felt like it could be worn for hours without issue. Technically speaking, once cables are attached, the Meta 2 weighs more than the HoloLens, but with much of the weight on the back, it just feels lighter. Now to put that into perspective, and simply to be fair, I am a BIG guy. Something that I can wear all day long without an issue may affect someone else completely different. Just putting that out there. OK, so the field of view of this device is simply glorious. That said, I am of the camp that it could be a little too much, but if this is a device you are using in an office as a replacement for a 2D screen, as it seems to be intended to be used, then it should be fine. On the other hand, if you are connecting this to a laptop in your backpack and going places with it, I expect there is a chance you might trip and break something. I have to say this element surprised me as well. The picture quality was fantastic. I expected with the size of the field of view, a trade-off was being made somewhere and that the rendering would be completely stretched out and pixelated. That was simply not the case. A very pleasant surprise. This was really hard to get a feel of in the extremely chaotic and loud environment that was the Meta booth. I did get to play with a virtual instrument that produced decent quality sound. That said, with my pro-audio (live sound and recording) background, I do not feel like it was enough to give a complete stamp of approval until I have heard it in a more office-like environment. Now, let me start off and say this is mixed. While I do try to avoid direct comparisons, it is fair to say that Microsoft has set a pretty high bar in terms of tracking. Temper those expectations a little. Gestures on the other hand, while completely different, are equally as useful — with caveats. Meta has a collection of sensors and a 720p RGB camera it uses for tracking and seeing the users hands. If you watch the live demo, you can see the quality of the tracking yourself. It is jumpy. Of course, that jumpiness can break you out of the immersion of an experience, but it is no worse than what has been seen in the demos. If anything, I do believe Meron Gribetz when he said, "This is real guys. This isn't hacked." In terms of gestures, the only ones I saw were the "Grab" and "Touch" gestures. Overall, controlling the tools and system was very cool. But there was a problem in regards to the gestures. Knowing exactly where your hand is in relationship to the various holograms in the headset did prove to be a bit of a challenge. Sometimes finding the object you were trying to grab, especially if an object was in front of it, felt like an embarrassing and tough task to accomplish. That said, in some ways, the hand-tracking and gesture system that the Meta 2 uses is a more natural way to interact with a machine than anything else I have tried. Here, I have been given different information, but I will assume that what Ryan Pamplin told me is the case. When asked if Meta 2 used Unity as its development environment — which was what I had been led to believe — Pamplin let me know that Meta 2 has its own development tools. With not having heard or seen anything beyond this, it is hard to assess how tough it will be to create or convert apps for this system. In the current market, there are new choices emerging every month now. And soon it will be faster. One point that is very noticeable, with the current set of choices, is that they all do different things. I apologize if you see that as a "hey, can't we all just get along" cop-out. It just happens to be the case. If you are looking for a replacement for your monitor but still want to use your computer in your office, and do not need mobility, the Meta 2 looks like the right fit. With a wide field of view and a great image quality, having quick access to the tools and data you need will make this choice stand apart from the other offerings currently available. I look forward to getting one so I can do a deep dive soon and maybe getting a few of these applications I have been working on converted over.